ITAP is the Federal Interagency Committee on Invasive Terrestrial Animals and Pathogens. ITAP’s mission is to support and facilitate more efficient networking and sharing of technical information for program planning and coordination among federal agencies and departments involved with invasive species research and management. ITAP focuses on several major taxonomic groups of invasive species for which improved technical coordination is essential to facilitate effective Federal responses, e.g., currently on invertebrates, plant pathogens and animal pathogens. Furthermore, ITAP provides support for systematics in all taxa. ITAP does not receive any direct funding and the Memorandum of Understanding (MOU) that established ITAP is not a funding mechanism. Rather, the MOU among participating federal agencies provides the structure for focused frequent sharing of information, expertise, and other resources to support federal interagency collaboration. ITAP primarily provides information and facilitates technical input for federal resource managers and decision makers in over 54 federal agencies that deal with invasive species issues. A major function of ITAP is to provide an infrastructure for focused federal coordination at an earlier stage than would otherwise occur – i.e., when coordination is likely to be most effective and less costly (monetarily and ecologically). ITAP helps facilitate coordination among agencies in applying their legal mandates in addressing invasive species problems. ITAP’s network is able to rapidly locate and enlist expertise to provide information and technical advice for addressing invasive insect, plant disease, animal disease, and terrestrial animal species – including early detection, rapid assessment, and response to new invaders. ITAP provides leadership to facilitate implementation of activities that support the invasive species programs of its federal agency members. Leadership is achieved by facilitating exchange of scientific and technical information, informing respective agencies about options for collaboration, facilitating documentation of capacity and needs, coordinating specific interagency projects, contributing technical information to policymakers, enhancing agency awareness and understanding of invasive species issues through briefings, tours and other activities, and facilitating public awareness and education through the ITAP web site. What level of funding will be directed to ITAP? Who is the principal audience for ITAP activities? What level of leadership will the ITAP team provide? What are the potential products of ITAP coordination? How will ITAP improve Federal response to invasive terrestrial animals and pathogens? How will ITAP facilitate interactions between interested Federal Departments and Agencies? ITAP will not receive any direct funding and the Memorandum of Understanding (MOU) is not a funding mechanism. Rather, the MOU provides the structure for focused frequent sharing of information, expertise, and other resources to support interagency collaboration. ITAP will also facilitate technical input into the National Invasive Species Council (NISC) and associated interagency tasks. ITAP will help inform Agency decision makers about opportunities for collaboration in the areas of systematics, germplasm, pest detection, monitoring, forecasting, and assessment; pathways; and pest management. ITAP helps support NISC's priority-setting and cross-cut budget initiatives by reporting on baseline capacity for invasive species research and identifying needs for research and development, particularly to support rapid response to new invasive species. ITAP will primarily provide information and facilitate technical input for resource managers, and decision makers, including the Executive Branch, Congress, the National Invasive Species Council (NISC), and State and local elected officials. ITAP will also receive and share information with commercial interests, non-governmental organizations, and the public. ITAP will principally reach this audience in cooperation with, and through mechanisms already established, by its member agencies. ITAP will provide leadership for facilitating implementation of activities that support NISC's National Invasive Species Management Plan and the invasive species programs of ITAP members. Leadership will be achieved by facilitating development of databases and other informational systems, informing respective agencies about options for collaboration, facilitating documentation of capacity and needs, coordinating interagency projects and regional work, contributing technical information to policymakers, and enhancing agency and Congressional awareness and understanding of invasive species issues through briefings, tours, and other activities, and facilitating public awareness and education. ITAP will also serve as a liaison with NISC, the Advisory Committee to the Council, and associated work groups. 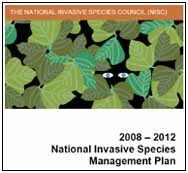 National perspective on invasive animal and pathogen problems and our capacity to address them, e.g., through traditional and on-line publications (such as a pest fact book), technical support for documentaries and other public media, Congressional briefings and tours (similar to (FICMNEW's participation in Weed Awareness Week), and provide input on cross-cut budgets. Comparable data standards and protocols for detecting and monitoring invasive species that can be shared among ITAP members and other agencies and organizations. Assessment of the impacts of invasive species already present in the US and ranking the potential invasiveness of species that potentially could be introduced and have adverse effects. Fora for discussion of priority research, monitoring, and management needs to coordinate these activities more efficiently. Databases and information sources on invasive species and their management - such as a catalogue of natural enemy importations similar to the Julien Catalogue. Working groups for coordinating Federal efforts on existing and emerging threats such as sudden oak death, West Nile virus, invasive birds, Asian long-horned beetle, and emerald ash borer. Special reports that highlight insect and disease conditions, threats, capacity and budget needs, and policy concerns and/or recommendations. Technical workshops on key issues such as evaluation methods for monitoring pathways. Technical advice for developing inter-organizational policy, such as a national pest or disease strategy, quarantine listings, screening processes and lists, and exclusion policies. A major function of ITAP will be to provide an infrastructure for focused Federal coordination at an earlier stage than would otherwise occur - i.e., when coordination is likely to be most effective and less costly (monetarily and ecologically). ITAP will help facilitate coordination among agencies in applying their legal mandates in addressing invasive species problems. ITAP's network will be able to rapidly locate and enlist expertise to provide information and technical advice for addressing invasive insect, plant disease, animal disease, and terrestrial animal species - including early detection, rapid assessment, and response to new invaders. As a permanent Federal committee, ITAP will provide infrastructure for continuous communication and effective coordination among senior program and technical staff. ITAP will serve as a reliable source of state-of-the-science information and technical support for the Council, ISAC, other interagency committees (e.g., FICMNEW, ANSTF), and Federal agencies in addressing threats from invaders, ensuring that the same accurate information is available to all participants. ITAP also will improve access to complementary scientific and technical expertise among the Federal Departments and Agencies on a continuing basis. For example, for a plant disease threat, ITAP could help link Agriculture's sophisticated laboratory facilities and extensive research capacity with Interior's expertise in design of monitoring and modeling/forecasting systems to develop a coordinated response. The shared resources of our member agencies can therefore be harnessed to address invasive issues, not just species by species, but in a coordinated fashion that can look at cumulative impacts of invasive species to biological and human communities and ecosystems.